Khoresht-e fesenjan or pomegranate-walnut stew is a classic Persian dish typically eaten during winter months in Iran. It consists of poultry, usually chicken, cooked slowly in a thick sauce of pomegranate syrup, ground walnuts and spices. Making fesenjan at home is part of a larger project I'm undertaking this winter to learn more about Persian food. I'm being guided by a friend who has been sharing recipes and spices that he gets from his in-laws in Iran. He recommended that I start my project with fesenjan for its simple preparation and sumptuous flavors. Fesenjan can be made for weeknight dinner because it requires not much more than the time to operate the food processor and simmer the chicken to doneness. 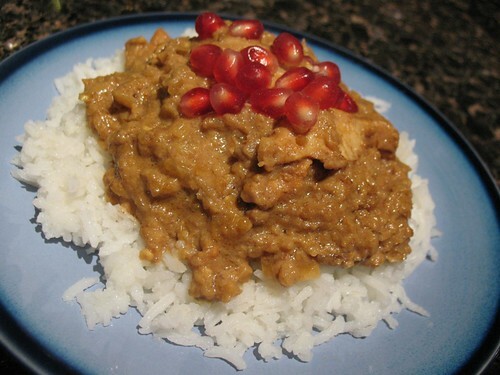 The pomegranate in the stew lends both tartness and sweetness, and the walnuts, a soothing, earthy creaminess. The tenderness of the poultry only adds to the luxuriousness of the dish. It is this brightness and comfort that make fesenjan an easy winter indulgence. In a Dutch oven, melt the butter over medium heat. Add the onions and brown the chicken. Add the salt. In a medium bowl, mix together the pomegranate molasses, cinnamon, saffron water and sugar to make a paste. Add the paste to the chicken and onions. Mix thoroughly. Cover and cook over low heat for about 1 hour and 20 minutes, stirring occasionally to prevent burning. Sparingly add water if the sauce gets too thick. Add pomegranate molasses and/or sugar to make the dish as tart and/or sweet as you like. Serve the stew with rice immediately, or wait until the following day to allow the flavors to come together. Just before serving, sprinkle the fesenjan with fresh pomegranate seeds. Want to experience fesenjan but don't feel like cooking? Masouleh Restaurant (6653 N. Clark St.) serves the chicken stew. Vegetarian or vegan? Try fesenjan made with eggplant and a rainbow of spices.